"This property is stunning! Beautifully restored brownstone. The hardest part about leaving NY was leaving this beautiful house. We were a group of 6 adults and 1 toddler and had plenty of room. The kitchen is fully equipped, the bathrooms are spacious and beds were super comfortable. The C train, supermarkets, pharmacy, restaurants and a liquor store are just a short walk down the road. Would definitely recommend this property to anyone wishing to stay in Manhattan." "We have just spent two weeks in this beautifully restored house with our three adult children and two of their partners. The house gave us ample space in which to have a very relaxing holiday. The beds were all particularly comfortable. The house is equipped with every possible amenity and is in a lovely quiet and peaceful location. The house is beautifully placed to stay whilst exploring all parts of Manhatten. It was a privilege to stay in the house and we would strongly recommend it to a family visiting NYC." All our visitors love staying here! Our beautiful landmarked brownstone home is a base for New York visitors who would rather get a taste of dignified Manhattan living, in a home-from-home, than pay out for a hotel and all those expensive restaurant meals. The house, in the Historic Morris-Jumel District, is a restored Victorian gem, full of traditional features, great rooms, and beautiful woodwork, but with all the benefits of contemporary living and very family-friendly. It is fully furnished, with all domestic supplies, and with utility costs included in the price. There are ceiling fans throughout, and the bedrooms are air-conditioned. The whole house has full wireless Internet access. At the end of the block is the C train, which takes you rapidly downtown to all the sites in 15 minutes, as well as just a few stops uptown to the famous medieval art of The Cloisters and Fort Tryon Park. The full house is available for visitors, on three floors. First floor: a spacious front parlor with decorated fireplace and mantle overlooking the park, a dining room with table for eight, a large eat-in gourmet granite-topped kitchen (with all supplies – stove, oven, dishwasher, microwave, 2 fridges, and freezer) and a half-bathroom. Second floor: two large bedrooms – the sunlit master bedroom at the front has a four-poster queen-size bed (plus a dressing area full of closets and an en-suite sink) and the second bedroom at the rear has a queen-size sofa-bed for two (also with a closeted dressing area). The principal bathroom, in Carrera marble, has a classic claw-foot tub and a separate shower. Third floor: two further terrific bedrooms, front and rear, plus a second bathroom with full shower. Each large bedroom contains a single bed, with a trundle bed underneath for a second guest if needed. There are armchairs, dressers and closets in each room. The layout of the house means it is suitable for a couple who want a lot of space and quiet, a single family with up to four children, or two families where the parents can sleep on the second floor, and two sets of kids on the top floor! The area around the house is just as interesting. Opposite is a park and the historic Palladian Morris-Jumel Mansion of 1760, Manhattan’s oldest freestanding building. The mansion grounds are great to walk in, and the mansion itself, now a small museum, is full of wild history and famous connections – from George Washington and Aaron Burr (Madame Jumel’s second husband!) to Napoleon. There are lots of events for kids. Beyond the local attractions, a short ride on the C train from the end of the block takes you to all the great sites of Manhattan – Central Park, the Natural History Museum, Lincoln Center, the Empire State Building, the great shopping and restaurants of the Upper West Side, the Metropolitan Museum, the Frick Collection, the Guggenheim museum, and countless other places to visit. Our location perfectly combines a sense of serene quiet and getting away from the bustle, with being close to everything you could want to see! We are a family with two teenage children. Richard and Melissa run a not-for-profit organization specializing in services to the arts. We work from Central Harlem and love to come back to our lovely brownstone to enjoy the peace and quiet after busy days and travel all over the country! Our kids are in public schools in Manhattan and travel on their own safely all over the city. We are slow foodies, love wine, trekking, and all the cultural offerings of our great city! To have a large and quiet space in Manhattan is a dream come true for us! Everyone adores our restored home, with its spaciousness, and its beautiful and elegant rooms, but also for its hominess and sense of family. We have lavished all our care on creating a relaxing family home, and love to share it with guests from around the world. You'll never forget it! We chose this home because it combined gracious living with easy access to the city. We wanted somewhere really quiet and restful (hard to find in busy Manhattan) with lots of antique features. We especially love the ceilings with their intricate moldings, the carved cherry wood throughout the Parlor floor and staircase, and the deep clawfoot tub for bathing! Combining these features with contemporary amenities seems to us the best of all possible worlds! The second floor Bathroom features a traditional cast-iron claw-foot tub - amazingly deep for a long soak! The large shower is separate. This Bathroom has an elegant appeal with black and white Carrera marble throughout. The third floor Bathroom is equally attractive, featuring Italian travertine marble floor and walls. There is a large shower stall. Window air-conditioners are in each of the bedrooms. In the third floor laundry room, which also has a large deep sink. A full electric dryer stacked on the washing machine. There is a large working wood stove in the main Parlor living room. The bright Parlor floor living room off the main hall and stairway is the main reception room as you enter, overlooking the park. Beautifully proportioned, it has sofa, chairs, wood stove and piano. 2 under-counter fridges provide plenty of space! A large freezer is also available. 4 gas-fired burners, plus an electric oven. Also a burr grinder for beans. Versatile toaster oven for different needs. The walk-in pantry includes a variety of available herbs and basic cooking needs. Plenty of room to easily store all your provisions! Fully stocked for up to 8 people. The fully modernized eat-in kitchen has a full stove, 2 fridges, dishwasher, microwave, and granite-topped island with two-bowl cast iron sink. There is a walk-in pantry and half-bath, TV and Bose. Through Victorian pocket doors from the kitchen, the dining-room offers a second eating space, with an oval table and sideboard. Flat-screen TV with hundreds of cable channels is in the eat-in kitchen. Bose music player and radio, with cable for iPods, iPhones and other MP3 players is in the kitchen. Blue-Ray player linked to the TV. The book collection is spread throughout the house. Board games, cards, bananagrams and others are all stacked in the dining room. A cabinet of CDs is mainly classical and jazz. A cabinet full of DVDs for many tastes! We just loved our vacation... We came all the way from Texas with 4 adults and 4 children. Plenty of room for all of us! Nice and clean and super gorgeous!! You definitely want to stay here!! I took my son, daughter and two friends to New York for a week. My son and two friends did most of the sight seeing stuff and my daughter and I shopped. It was a wonderful week but blisteringly hot. At the end of the day we just wanted to go back to our wonderful air conditioned brownstone and relax. The owners were very accommodating and everything was very easy, from check in to check out, to allowing 3 extra guests for the weekend. We felt like quintessential New Yorkers returning each day, by subway, to our lovely home. I would stay here again in a heartbeat. Superb, do NOT look any further!! The location, the interior, everything about this wonderful renovated brownstone house is as we had hoped for when we read the reviews and saw the pictures. We stayed here for 6 nights and it is a great basis for exploring NYC. The journey on the subway takes only 20 minutes to midtown Manhattan. The neighborhood is clean and felt safe even when we returned later in the evening. The grocery store is nearby as are the pharmacy and liquor store. When we were in the house we spend most of our time in the lovely kitchen because of its warm cozy family feel. The owners are very friendly and helpful and will assist and advice you if you would have any questions during your stay. In short, it almost feels wrong to recommend this property because it could decrease the possibility/availability for us to rebook when we will return to NYC! Lovely house, clean, comfortable and convenient. A privilege to stay in such a lovely property. The house was clean, plenty of space and well equipped. Bedrooms were spacious and beds very comfortable. Located on a quiet street just 5 minutes walk from local shops and subway. Air conditioning and 2 bathrooms were very welcome during the heatwave! The owner was friendly and helpful and booking very straight forward. 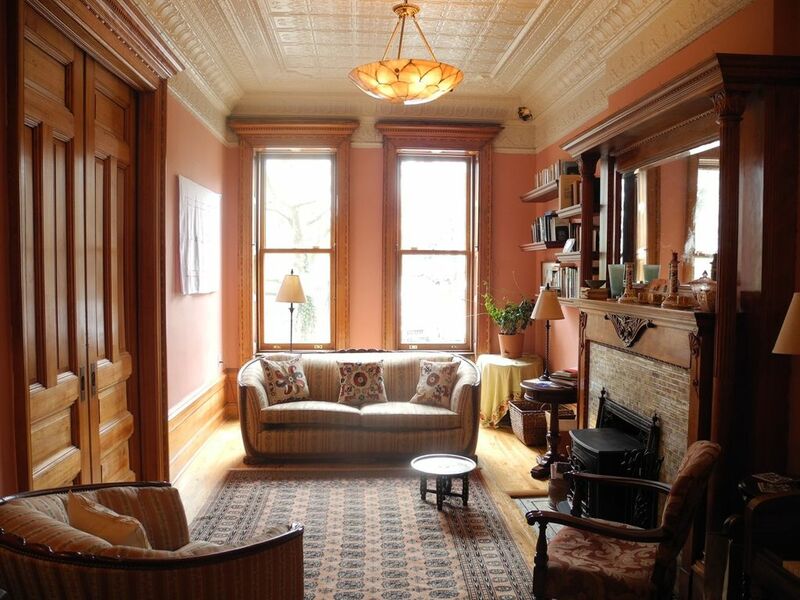 Would not hesitate to recommend it or to stay in this beautifully restored brownstone again. Thank you. A beautiful brownstone home with all the amenities we needed. The pictures of this home do not do it justice. It's a lovely home in a nice neighborhood. The six of us were comfortable and felt as though we were home. We were able to walk to some wonderful restuarants and the subway stop was convenient for us to get to all of our sight seeing spots. I definitively would stay here again and recommend it to any fellow travelers. My wife and I had a wonderful time in New York and enjoyed the historic home. We joined my daughter and her family. The brownstone is well-located and was very comfortable and beautifully furnished. Everything worked fine and I hope we all took care of it to the owner's satisfaction. I could tell he was a bibliophile as there are books everywhere. I thought he might be a professor somewhere as, for instance, there were multiple books on James Joyce. Anyway, I hope to come back someday. Thanks. Our house is in the wonderful quiet residential neighborhood called the Morris-Jumel Historic District in upper Manhattan. All the houses are landmarked and the street has been called 'the most beautiful in the city' by New York magazine. It's incredibly peaceful and the unrestricted view from our Victorian brownstone is across to the park around Manhattan's oldest house - the 1760 Jumel Mansion (now a museum and great to visit - kids love the stories of presidents visiting and intrigue around the infamous Madame Jumel). The Mansion's park is our front yard for a stroll, picnic or sun-bathe. From the house, it's 15 minutes on the C train down to all mid-town attractions, museums, Lincoln Center, Central Park, the Empire State Building, the Natural History Museum, Times Square, the aircraft carrier Endeavor, and so much more. The Upper West Side has great shopping, restaurants and recreation. The Greenway up and down the Hudson River allows cycling the whole length of the Island, as well as a brilliant afternoon stroll to watch the sailboats, the kayaks, and the people! Just a couple of subway stops to the north is The Cloisters, the medieval part of The Metropolitan Museum, a wondrous building with great art, the legendary Unicorn Tapestries, and views high over the Hudson River, surrounded by Fort Tryon Park, a favorite for families to picnic and play. From our quiet sanctuary, you can easily access all the sites of Manhattan, and also get out of town to the Hudson River countryside if you want a day out of town - great river gorge scenery, quaint small villages, antiquing, wineries, farms and pick-your-own. It's got the lot!